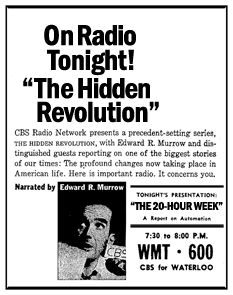 Veteran CBS news announcer Howard K. Smith views the Beat Generation through the lens of conventional conservative horn-rimmed glasses in “The Cool Rebellion,” first broadcast as part of the 1960 CBS radio news series The Hidden Revolution. The segment is presented below at the end of this article from the Aeolus 13 Umbra YouTube Channel. Aeolus 13 Umbra first turned its attention to the venerable Mr. Smith in Rare Video: Howard K. Smith Commentary on Television and the Apollo 11 Moon Landing, July 20, 1969, as well as contemporary views of the Beat Generation in the WNYC FM radio documentary, “Footloose in Greenwich Village,” also broadcast in 1960. While the WNYC documentary provides a more objective look at the Beats, Smith interprets the movement as a counter to the prevalent conservative attitudes of the times — which, of course, it was. Smith cherry-picks segments that highlight the more stereotypical elements of the Beat Movement: protestations against material consumerism, disgruntled relationships with parents and the older generation, and the search for spiritualism. It is here, on the eve of the 1960s countercultural revolution, that we see the core philosophical beliefs typified by “hippies” embodied by the Beats. Middle-Class Man: My first responsibility would be my family, and I think that should be yours. Beatnik: I was raised to believe the same thing and I fought against it. Middle-Class Man: I think it is a shame, an absolute shame, that a man of your intelligence — I’m not saying this in a derogatory manner, believe me — that a man of your intelligence doesn’t put what you think to work in a proper way. You’re going to have to find your God, that’s the first thing you’re going to have to find. Beatnik: Well, I don’t feel I need God. I have faith in myself. Middle-Class Man: Ah . . . ah . . . I think I got the answer. Middle-Class Man: You’re emotionally immature. After hearing that exchange, I understood why so many young people in the counterculture found themselves in opposition to the older generation, and conservatism in particular. It is ironic, however, and a sad commentary on our society, that we can find the same philosophical gap between progressives and conservatives being played out today. Listening to this report, one gets the feeling that Smith thinks the Beats are a fad that will pass as they get older. Well, the Beat Movement was a fad of sorts, but the Beats themselves evolved into something more than just a media curiosity. Over the next ten years, the progressive counter-cultural revolution pushed society forward on an often rocky, but steady evolution.